Are you struggling to identify which wheel weights are best for you? Maybe you need better value for money or to break away from the same supplier because you think it’s the most convenient? What many fitting tyres don’t realise is the power that good account management and a vast array of online stock can have for both their ordering process and bottom line. They love the bulk offers that help them save big! They know and trust their account manager who is only a phone call away! All this flexibility mean order wheel weights suits how you want to buy, helps you save time stocking up and gives you peace of mind that supply is never far away. Our philosophy is simple – offer the best product at a competitive price in the most convenient way for our customers, with a team to help at any stage of the purchase. Covering all types of passenger and commercial vehicle, our popular and comprehensive range of wheel balancing weights means you can stock up to cover all requirements in one easy order. From steel & alloy Knock on Weights through to Self-Adhesive Weights. We can even supply commercial Truck Wheel Weights. 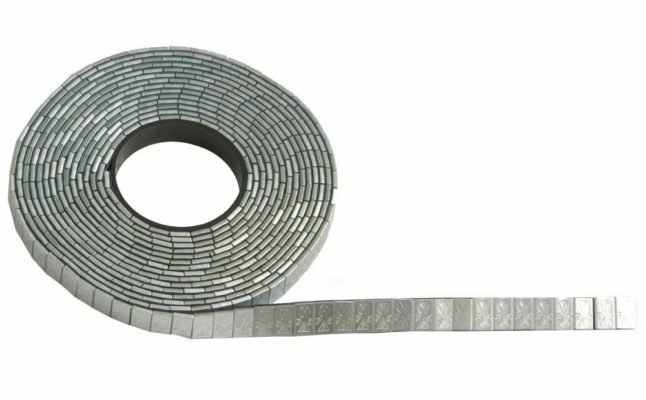 Self adhesive balancing weights, also known as stick on weights, are one of the most popular consumable items we sell at Tyre Bay Direct. They are used for the balancing of alloy wheels and are super easy to apply. Self adhesive weights are available in either a matt, polished or slick black finish. With so many weight options and finishes to choose from we are sure to have the right self adhesive wheel balancing weights for you, including the most common 5g and 10g sections, 5g only sections and 2.5g sections. Known as a more traditional weight for wheel balancing, we stock a comprehensive range of Lead-free Zinc Alloy Coated Knock On Weights for Alloy Wheels and Knock On Weights for Steel Wheels. Offering a range of knock on weights from 5g to 60g, these are available in packs of 50 or 100. By bulk ordering your wheel weights today, you can save over £20! We think it makes sense given you are buying weights you’ll need anyway! (Remember, the bigger the quantity, the bigger the savings! Ensure to get over £50 worth for free delivery on qualifying orders. Check out these incredible Tyre Balancing Weight offers online today or call our team on 01527 883 580 to meet your account manager and discuss your requirements. Want to see all our vast range of consumables? Then check them out online today. This entry was posted in Garage Consumables and tagged Tyre Weights, Wheel Balancing, Wheel Weights. Automechanika 2019: A Diamond Opportunity to see Tyre Bay Direct!